Need to bake potatoes for 20, 50, or more people? You can actually bake them ahead of time and keep them warm for up to 6 hours before you need to have them ready. Learn how to make baked potatoes for a crowd, the easy way! To bake a lot of potatoes at one time, first try to pick out potatoes of similar size so that they will bake evenly in the oven. Preheat the oven to 500 degrees. Normally you would bake the potatoes at 400 degrees, but when you are cooking this many potatoes at one time it would take them too long to cook at that temperature. Wash the potatoes well, and scrub them with a vegetable brush. Lightly coat the potatoes with olive oil or vegetable oil, and cover them with a light coating of sea salt. Gently prick each potato with a fork a couple of times. Place the prepared potatoes on a large baking sheet, making sure that none of the potatoes are touching each other. You can cook more than one baking sheet of potatoes at a time, so place as many potatoes in the oven as you have room for. Bake the potatoes for 30 minutes on one side and then turn them over and bake them for 30 more minutes. The potatoes are done when you can easily stick a fork into them. While the potatoes are baking fill a cooler half full of hot water and let it sit until the potatoes are done. When the potatoes come out of the oven, pour the hot water out of the cooler and quickly place the baked potatoes in the warmed cooler. 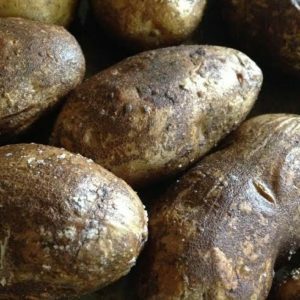 If you need to bake a second batch of potatoes, bake them and then place them in the cooler with the first batch. If you keep the cooler closed, the potatoes will stay warm up to 6 hours. Note: Some people like to bake potatoes with foil wrapped around them. This is fine if you are going to eat the potatoes right away, but it is not a good idea to use foil to store the potatoes in for hours at a time because bacteria can grow in the foil and possibly cause someone to get sick when they eat them. 1 Comment on "Baked Potatoes for a Crowd"
I want to serve baked potatoes on my hot dog carts. Can you give me hints on how to keep them warm and how to cook about 100 at a time?